In conjunction to the latest blockbuster movie, Transformers: Revenge of the Fallen, Glu Mobile has launched its Transformers CyberToy for the iPhone and iPod Touch users. The interactive graphic effects has been integrated for improving gaming experience. “The Glu team is excited to launch this unique entertainment application based on characters from the renowned Transformers toy line and movie series. Transformers CyberToy is a completely new type of application from Glu, allowing players to transform characters from vehicle to robot by utilizing the touch screen to interact with their favorite Transformers in a virtual environment,” said by Jill Braff, senior vice president of global publishing, Glu. The game offers gamers action figure mode which allows them to select various poses, play sounds and animations. Besides, the gamers can set up their signature artillery and, swap between robots and vehicles through a series of taps, touches, shakes as well as tilts. In addition, the game also provides the information of each powerful Transformers robot such as Bumblebee, Megatron, Starscream and Optimus Prime. 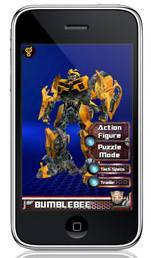 This application launches with Bumblebee and other characters will be added via updates later. The Transformers CyberToy is now available at the Apple app store for the price of $0.99.